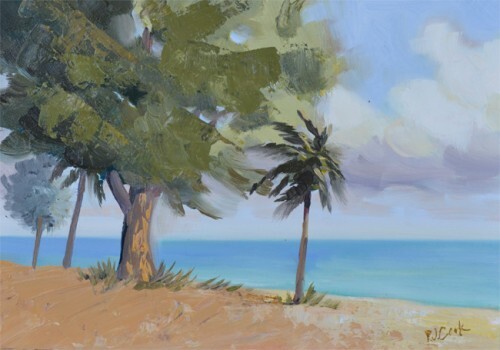 This small landscape oil painting is of the Fort Lauderdale Beach in Florida. I painted this on location while I sat on one of the picnic benches. Since plein air paintings are completed in a shorter period of time controlling the wet paint is a major concern. If the wet paint is not kept under control one can have a big mess on their hands and on the canvas. One way to work with the wet paint is to split the time spent working on the oil painting into two sessions. I did this with this small oil painting, I went to the Fort Lauderdale Beach on two consecutive days. On the second day most of the previous days paint was dry to the touch. On the second day I could add more details to the painting because the under-painting was relatively dry. If you click on the painting above to view a larger image of the painting you can see the texture of the thicker paint in some areas of the oil painting. For more info and photos on painting at the Ft. Lauderdale Beach view previous post here. Look for more plein air paintings to come as I am currently working on a series of small 5″ x 7″ oil paintings from southeast Florida.